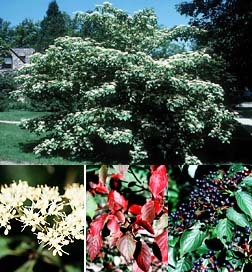 These large, dark greened, glossy leaved Pagoda Dogwood, with its showy, aromatic, clustered, tiny white, spring flowers appearing in May. In summer, the blue-black fruit on red pedicles held above the layered foliage is an impressive sight and persists for about a month. The Pagoda has unique horizontally layered branching that makes it a true specimen in anyone?s landscape. Its attractive early purple fall color gives this plant multi-season interest in the landscape. The Pagoda Dogwood (Cornus alternifolia) is a native plant that grows from the Mississippi River east from Zones three to seven. It grows in woods, thickets and on rocky slopes where it forms a small clump tree. It has been cultivated since 1880 and it is the only hardy dogwood tree in Minnesota. Although it grows naturally as a multi-stemmed shrub, it is commonly found as a single-stemmed tree about 25-feet high with a spread of about 20-feet. Pagoda dogwoods grow best in cool, shady areas and prefer moist, acidic, well-drained soil. They are known to be very drought sensitive and decline when grown in hot, dry sites. A good home landscape site would be under a large tree with other shrubs and perennials. The result will be an ornamental tree pleasing to the homeowner?s senses and a good source of food for the birds.